City Dent has decided, as well as the top dental clinics in Europe and the United States, to replace the classic film radiology with the digital one which presents a series of advantages. The most important one is that the quantity of X-rays to which the patient is exposed is reduced by up to 90%. The digital image stored by the apparatus is sent to a computer and with the help of a special soft in can be processed to the smallest details. Afterwards, the same image can be transmitted to any of the monitors in the clinic where the specialist doctor can analyse in great detail the received information and choose the appropriate treatment. The system also provides the forward of the X-ray abroad. There, if necessary, a second opinion can be obtained from specialists with whom our clinic collaborates. City Dent Clinic owns a Kodak 8000C system which offers panoramic images that allow quick and certain diagnostics in maximum comfort and safety conditions for our patients. With the help of the technology available in our clinic we can do X-rays even for children. 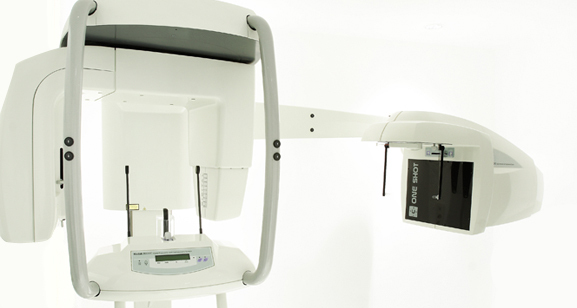 The Kodak 8000C system our clinic has is the latest generation digital radiology apparatus which can take standard panoramic images during a single exposure. In order to get a panoramic image similar to the one from our clinic, many of the digital radiology machines currently on the market, scan the patients head in 8 to 18 seconds. The technology offered by City Dent gives the possibility of obtaining a quality, undistorted image in only one second. Due to the wide range of panoramic images provided by the Kodak 8000C system, City Dent doctors have at their disposal an integrated, practical digital solution which helps them to maximise the accurateness of the diagnosis and to start treatment for our patients. In order to get maximum detail tooth images, City Dent purchased a Trophy radiology apparatus that places on the tooth a small, flat sensor sensitive to X-rays and connected to a latest generation soft. Due to this soft, the received image is analysed in great detail and offers the doctor the possibility to quickly and accurately diagnose the patient. With the help of the Trophy apparatus we have succeeded in replacing the classic dental film and in getting the necessary information in only one second. Also, when absolutely necessary, by taking the appropriate protection measures- the present device allows retro-alveolar dental X-rays even for pregnant women. We consider that by using the newest digital radiology technologies, due to which with minimal exposure our specialists get a clear detailed image, we maximise our patients comfort and safety. In addition, our clinic interior walls are platted with a double protection layer so that regardless in what clinic room you are, the X-ray devices activity is unnoticeable. Alongside using technology which offers the smallest exposure to X-rays (90% less than in most clinics in Romania), platting the clinics interior walls confirms our decision to offer services that are at safety standards superior to the present regulation, exigent by definition.